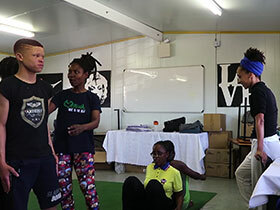 "ESKIN 4 the Visually Impaired" was created and performed at ISEA, the International Symposium of Performing Arts in Durban, Southafrica 2018 funded by ISEA and partners and Pro Helvetia, Switzerland. This video (23 min) features the making of a dance performance with visually impaired participants using a newly created interactive audiovisual platform by the Swiss based media-art team under the direction of media artist Jill Scott. The choreographers were Thobile Maphanga/Lorin Sookool, the light designer/filmmaker Marille Hahne, the real time visual designer Andrew Quinn, the audio engineer Vanessa Barrera Giraldo, the system designer Andreas Schiffler. Produced by AIL Production Zürich, ISEA Durban and the Mason Lincoln School Umlazi. This video (26 min) features a documentation of the 40 min long performance "ESKIN 4 the Visually Impaired", held at the Natural Science Research Center in Durban. Can visually impaired people engage in a world of culture that is so visually dominant? 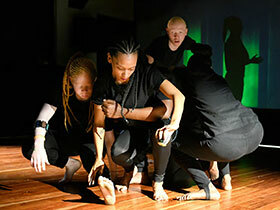 The "Eskin 4 the Visually Impaired" exhibition shows how an art and science platform was created to enable visually impaired participants from Durban, South Africa to become performers alongside their own stories about climate change. The documentary films about this project in Durban were incorporated into the exhibition next to five miniture sets that could be viewed through small tunnels from the outside. © Marille Hahne . All rights reserved.